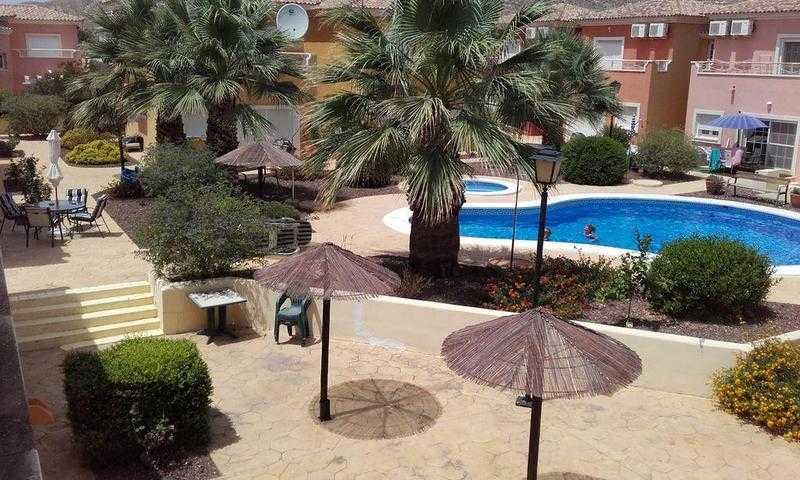 City or Beach your choice Murcia city only 15 minutes away or Beaches of Mar Menor and Cartagena only 20 minutes away .A tranquil beautiful small community with very well maintained pools. The main pool being 12 metres X 6 metres approx and a separate infants pool. The main grounds and gardens are set within a larger estate of Mosa Resort Banos Y Mendigo, 30155 Murcia just off the A30 again very well maintained gardens footpaths and roads. The Costa Cálida is the approximately 250 km stretch of Mediterranean coastline of the Spanish province of Murcia. This region has a micro-climate which features comparatively hot mean annual temperatures.There is a park area with basket ball court, 2 fixed table tennis tables, lovely gardens to take a walk and have rest on the many benches dotted around and a great picnic and BBQ area. For your peace of mind there is 24/7 security on the entrance gate as well as frequent patrols. Entrance passes will be organised in time for your arrival . Villa Feliz has all the facilities required for the perfect holiday, The patio doors of the villa open onto a terrace with 4 sunbeds, table and 4 chairs, a BBQ and parasols and gives you full access to the pool and gardens. The villa is located in an urbanization at the foot of a mountain area called El Valle a national park With walking access to the path towards the mountains for hiking and biking lovers, a place where your children could play outsIde with no stress for you.Villa Feliz is a beautiful modern villa with a fully equipped kitchen and a serving bar with granite work surfaces and it is fully tiled. There is a downstairs toilet and sink, a large lounge and dinning area with TV, DVD Free WiFi, duct air-conditioning and heating is fitted throughout also a great under stairs storage cupboard.A car is recommended.Nearest Golf is 1 km away.Off street parking with ramp to front terrace,we can accommodate wheel chairs with limited access to ground floor front and rear terrace,there is a down stairs loo with sink and a bed can be arrange in the lounge if required.Cafe bar onsite with Airemar shop just outside restaurant a cross the road. Security deposit is required and will be refunded within 7 days of your stay. Here in Spain managing our own property (no third party agents) so book with confidence. Friendly clean good value 4 of 5.Villa was excellent. Clean and beautifully furnished. The pool area and surrounding areas were well maintained with lovely gardens and.